Calls from outside PBX are answered and directed to their desired destination by the Auto Attendant system. 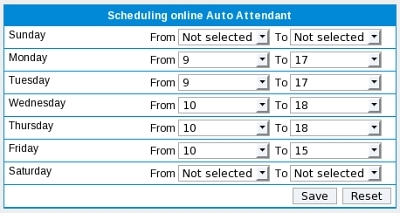 You can select different prompts for both the online and offline status of the Auto Attendant. Go to the menu Auto Attendant. Select Prompts from the submenu. Select Prompts from the submenu. Here you have a list of all the prompts you have added so far. Press the edit button associated with the prompt you want to edit. Press the listen button associated with the prompt you want to listen to. Select a key for every group of extensions in your system (ex: 1 for Support, 2 for Sales). Select Keys from the submenu. Select Keys from the submenu. Here you have a list of all the keys you have added so far. Press the edit button associated with the key you want to edit. Press the delete button associated with the key you want to delete. Specify time and date for the online status of the Auto Attendant. In order for calls outside Freesentral to reach the Auto Attendant, one needs to define one(or more) DIDs specifying the phone numbers that will be routed to it. This operation can be done from the Auto Attendant tab or directly from the DIDs tab.